If we really want to know how our body's cells work – or don't work, in the case of disease – we might need to look beyond their genes and even beyond the proteins they are made of. We may need to start going through the cellular "trash." The group of Dr. Yifat Merbl of the Weizmann Institute of Science developed a system to do just that, finding that "cellular dumpster-diving" contains information about the cell's function that is not otherwise seen. The group applied their new approach to profiling the immune cells of patients with an autoimmune disorder and discovered distinct evidence for a signature pattern that offers a new thinking about the underlying causes of this disease and in the future, may lead to better diagnostic techniques. Some 70% of the proteins in the body are broken down by the cell's degradation and recycling units known as proteasomes. Included in these are the short-lived proteins that are made for specific purposes, for example, to mount an immune response. "These proteins may be produced in small amounts, relative to structural proteins, and may be tightly regulated and degraded quickly, so standard proteomics surveys tend to miss them," says Merbl, who is in the Institute's Immunology Department. "But they are precisely the proteins that are crucial to the cell's functions, and thus their malfunctioning plays a role in many diseases. Current proteomics," she adds, "generates detailed lists of the proteins expressed in cells, which is like trying to understand the lifestyle of people by looking at successive snapshots of their house. We can get some sense of their taste in furniture and art, their ages and maybe whether they like to read or cook. Getting successive snapshots of their trash, on the other hand, will tell us what they eat, what medications they take, what they buy and where they travelled. In the same way, when we looked at the contents of cellular trash cans, we were able to profile the disease state on the level of the cell's activities and its protein turnover, as well as uncovering some clues as to what goes wrong in these cells to bring about the symptoms of the disease." "We focus on degraded proteins, in general, because finding the proteins a cell has recently used can tell us about the major activities in the cell at that time," says Dr. Avital Eisenberg-Lerner in Merbl's lab. "It also gives us clues as to the state of protein monitoring such as in the case of damaged or altered proteins that need to be removed from the cell. This information is also valuable for identifying events which may lead to disease. For example, if too little of a growth signal is discarded, the result might be cancer while degrading too much of an immune regulator or suppressor of inflammation may be tied to autoimmune disease." The research team, which included the lab of Prof. Mariana Kaplan, a systemic autoimmunity expert at the US National Institutes of Health, as well as members of the Nancy and Stephen Grand Israel National Center for Personalized Medicine on the Weizmann campus, focused on systemic lupus erythematosus (SLE), an autoimmune disorder that is difficult to diagnose, which has no cure, and for which the cause remains unclear. What is known is that lupus involves abnormal white blood cell function, and that multiple organs in the body are attacked by its own immune system. Crucial to the study's success was the technique the team developed for isolating the proteasomes from cells — pulling them out together with the pieces of proteins, or peptides, preserved in the midst of the degradation process inside or around the proteasome machinery. The team removed the proteasomes from white blood cells taken from both lupus patients and healthy controls, and then carefully pried the peptides out. These were screened with mass spectrometry, and the discarded peptide profile of the two groups compared. 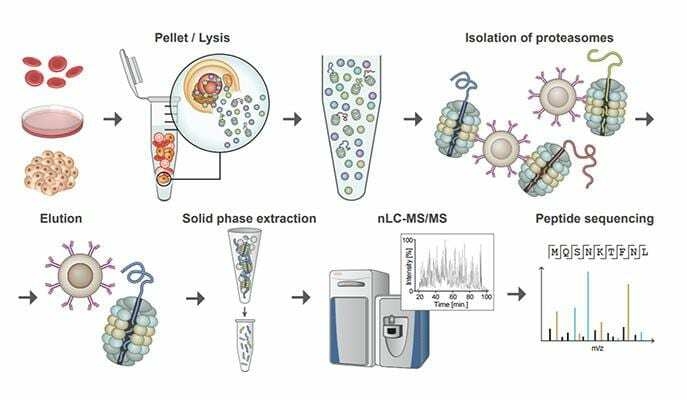 The team named their approach MAPP, for Mass spectrometry Analysis of Proteolytic Peptides. "One of the key advantages of this system is that it allows us to extract information about aberrant processes in cells even from very low amount of biological material, making the process possibly clinically relevant," says Hila Wolf-Levy, a first co-author of this study, which was pulblished online today in Nature Biotechnology. The lupus group did, indeed, reveal a distinct MAPP profile, clearly separating them from the group of healthy subjects. What's more, the standard proteomics tests the team conducted in comparison did not reveal this division, suggesting that rummaging through the cells' trash may be the key to gaining new insight on this disease on the molecular level. The most glaring of the proteins that were under- or over-represented in the patients' proteasomes were members of a family called histones, which were getting degraded at a higher level. Histones have several vital functions within the cell, but they have been associated with disease, particularly autoimmune disease, when they are found in above-average quantities outside the cells. The current understanding says that in lupus, an excess of white blood cells die, spilling their contents, including the histones, into the bloodstream. The immune system then identifies the added histone peptides as foreign antigens and undertakes its response against these particular pieces of protein. "But our findings suggest that something takes place earlier in the white blood cells," says Merbl. "These are cells that normally take peptides from bacteria or viruses and present them on their outer membrane like little flags alerting the immune system to a pathogen. We think the cells from the lupus patients might do the same thing with the extra histone peptides, which may be degraded due to an aberration in the proteins, and may then be identified as antigens by the rest of the immune system." Merbl also points out that the experiments were conducted on liquid biopsies from standard blood samples extracted from patients in the clinic, so if it can be shown in further experiments that the signature the group discovered is unique to lupus among similar autoimmune diseases, such testing could conceivably make its way to hospital labs in the not-so-distant future. The research group believes the level of detail they obtained through the new approach and technology may provide the resolution needed to help understand the underlying mechanisms of numerous diseases involving damaged proteins and the cellular proteasome system. What is exciting to Merbl and her group, however, is the possibilities the MAPP method opens up: Since every cell has its own contingent of proteasomes for breaking down used-up and damaged proteins, the cellular "trash collection" technique could yield valuable insight into numerous aspects of basic and translational biology ranging from cancer and cancer immunotherapy, to basic research on protein regulation. Dr. Yifat Merbl's research is supported by Dr. Celia and Dr. Lutz Zwillenberg-Fridman; Ellie Adie; the Peter and Patricia Gruber Awards; and Carla Hunter. Dr. Merbl is the incumbent of the Leonard and Carol Berall Career Development Chair.